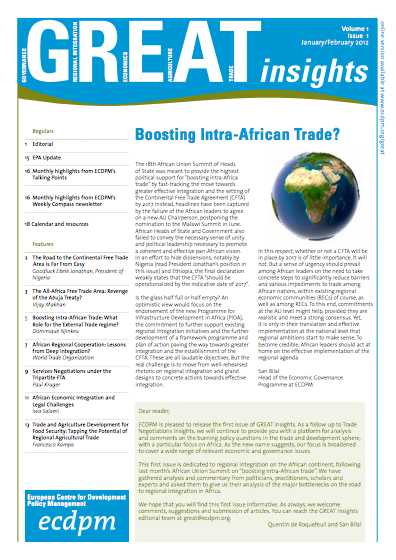 ECDPMGreat Insights magazineBoosting Intra-African Trade: What Role for the External Trade Regime? African Heads of States and Governments convened in Addis Ababa, Ethiopia January 29-30 to launch a continent-wide free trade agreement (CFTA). The Summit focused on solutions to the numerous impediments that hinder intra-African trade that come in four clusters: trade facilitation, productive capacity, trade related infrastructure and trade policy. Adequate attention would need to be given to each of these clusters. No doubt most of these impediments are attributed to the first three but this note focuses only on the last. 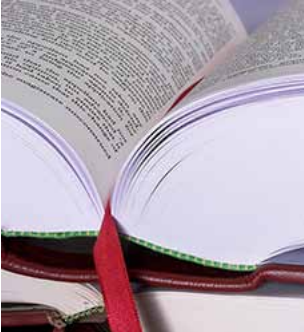 The trade policy itself is broad with the gist of the needed reform on the domestic agenda. The external trade regime should however not be overlooked. Differences in – and uncertainty of – access to major markets outside Africa could become a distraction and undermine the CFTA. African Governments and the international community should ensure that this does not happen, that attention is focused on fostering regional integration and boosting intra-regional trade. African countries have small market size underscoring the emphasis to regional integration. Effective regional integration in Africa would not only enhance trade within Africa but it would also attract investment in manufacturing. Experience in many countries has demonstrated that light manufacturing can be a major source of job creation and economic growth. African countries remain highly fragmented, preventing investment by firms in the development of efficient supply chains on the continent. During the next decade China will be off-shoring some of its more labour-intensive manufacturing, creating a unique opportunity for producers in lower-income countries to break in. 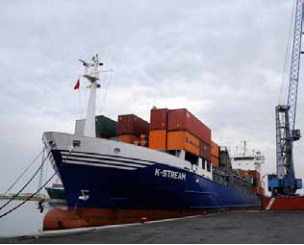 Market access programs in OECD and emerging market economies’ towards promoting African trade need to support greater exports of manufactured goods. 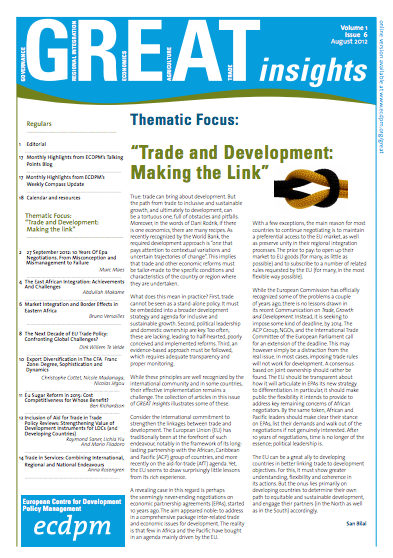 Of particular importance are the inclusion of all products, rules of origin that are consistent with global sourcing of inputs, and eligibility criterion that support cross-border production networks in Africa. 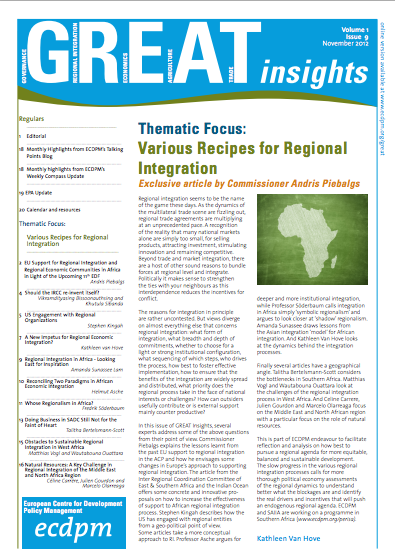 Africa’s Regional Economic Communities (RECs) are adopting uniform policies among their members. But they are expected to trade with the rest of the world under various international trade regimes. This undermines regional integration and trade diversification. In 2005, high-income World Trade Organization (WTO) members agreed to provide least-developed countries (LDCs), most of which are in Africa, with duty-free, quota-free (DFQF) access for at least 97% of their tariff lines (product categories). 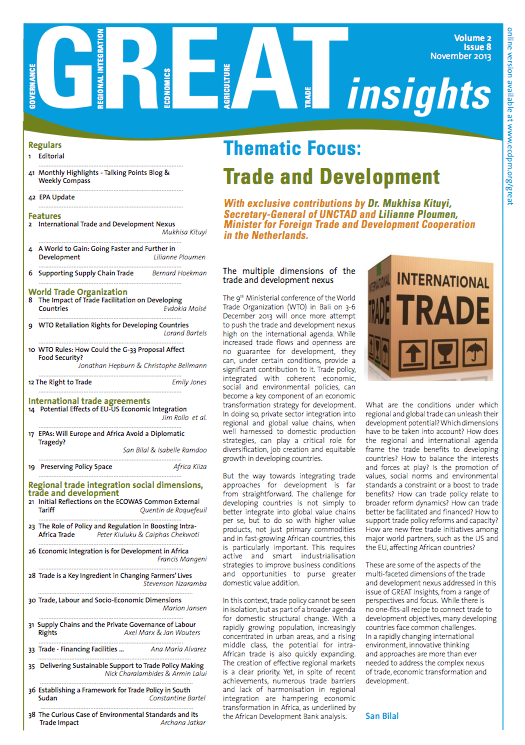 Other developing countries (non-LDCs) are either granted General System of Preferences (GSP) – which are generally less generous than terms offered to LDCs– or they must negotiate reciprocal free trade agreements with higher-income trading partners to secure adequate market access for their products. In the current situation Côte d’Ivoire and Cameroon that are gateways and central to trade in UEMOA and CEMAC, will face differential access to OECD markets, and in return are expected to offer different market access to their own markets, than their poorer and landlocked neighbours. This makes it difficult for them to form a supply chain or production network. The limited human, financial and institutional capacity of these and other African countries have been allocated to the negotiations of Economic Partnership Agreements (EPAs) over the last decade and these negotiations are currently stalled. 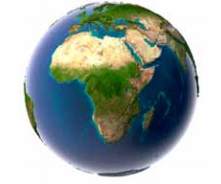 Even if the EPAs had succeeded, the terms under which Africa would trade with Europe would be different from those applicable for trade with the US under the Africa Growth and Opportunity Act (AGOA) or trade with other partners. There is a need to consolidate existing market access schemes into one that is consistent with a CFTA in order to foster regional integration and trade diversification (for an overview of existing unilateral preferential market access schemes offered by industrialized countries, see table 1). Failure to do so will keep the unhealthy divide between LDCs and non-LDCs in RECs that are aspiring to implement effective customs unions. The emerging trade regime also needs to be WTO compatible; to that effect, it is necessary that any preference scheme granting duty-free and quota-free access apply eligibility criteria that do not discriminate on the basis of geography. One such criterion that would support investment in manufacturing in Africa would be to use a cut-off threshold of manufactured exports per head of population. As noted by the African Union Commission background paper for the Summit, such a threshold could be determined so as to include all members of African customs unions. There is no doubt that trade preferences should be viewed only as a temporary arrangement. What is needed is to extend the period of the current trade regimes (say until 2020) and consolidate their conditions in a manner that supports manufacturing and consolidate regional markets. For example this could be done in such a manner that no country is worse off. One approach is to grant DFQF access to all countries that fall below a manufactured exports threshold would obviate the need for least industrialised countries that are not LDCs to negotiate reciprocal FTAs such as the EPA with the EU. International partners and African countries should adopt a policy that revolves around access to high-income and emerging market countries linked to progress in integration with neighbouring countries. This would be superior to the current approach embodied in EPAs, income-based GSP programmes or geographically-based, temporary DFQF programs. Such a trade scheme will also help foster the realization of the CFTA. There is no doubt that trade preferences should be viewed only as a temporary arrangement. What is needed is to extend the period of the current trade regimes (say until 2020) and consolidate their conditions in a manner that supports manufacturing and consolidate regional markets. For example this could be done in such a manner that no country is worse off. One approach is to grant DFQF access to all countries that fall below a manufactured exports threshold would obviate the need for least industrialised countries that are not LDCs to negotiate reciprocal FTAs such as the EPA with the EU. International partners and African countries should adopt a policy that revolves around access to high-income and emerging market countries linked to progress in integration with neighbouring countries. This would be superior to the current approach embodied in EPAs, income-based GSP programmes or geographically-based, temporary DFQF programs. Such a trade scheme will also help foster the realization of the CFTA. Again the main point is that the CFTA is an all-encompassing process that requires the full attention of all African trade stakeholders during its negotiations. External trade policy is a small but part of the agenda that should concentrate primarily on domestic reform within REC and across RECs such as to foster a vibrant African Economic Community. However the external trade regime is not an insignificant component; external trade regimes under which African trade takes place need to be consolidated to support regional integration. Five specific actions are required. First, on the European side the ongoing process of revamping the European GSP regime should provide an alternative to the stalled EPA negotiations. Second, on the US side the best elements of the AGOA should be made less uncertain. Third, the African governments and the African Union Commission should push for the EU GSP and AGOA, and other external trade regimes to which African countries are parties, to be consolidated into one single scheme to be considered in the G20 framework. Fourth, African governments should adopt a mechanism for building credibility and ensuring implementation; this could be done through a time-bound, monitored progress towards intra-regional trade liberalization through sub-regional organizations. Fifth, this mechanism for building credibility and ensuring implementation needs to adequately engage and empower the relevant stakeholders: RECs and dominant economies such as Nigeria and South Africa, the private sector and the civil society should play lead roles. The empowerment of stakeholders should include enhancing the human and institutional capacity of governments, REC Secretariats, private sector and other non-state actors. A framework for consensus building between and among these stakeholders is also very important. Dominique Njinkeu is a Lead Trade Facilitation Expert and the Program Coordinator of the Trade Facilitation Facility (TFF) at the International Trade Department of the World Bank. Dominique is an active member of the trade and development community; he is particularly involved with the Trade Policy Centre for Africa (TRAPCA) and the African Economic Research Consortium (AERC).